Swamped right now. Posts will continue soon. Here is an interesting thought that surely must have crossed many people’s minds in the past. As I sit on my patio I watch the solar lights that surround it and firmly believe that every survivalist should have several of these solar powered landscape lights for use at their bug out retreat or their home in the event of an emergency. These little 21st Century wonders function from small LED which do not provide much light output but never the less it is enough so that you can safely see where your sidewalk is. Granted these units are not too good for heavy reading but they will provide you with light to function safely in the evening. They actually can serve several purposes. If placed along the perimeter of your retreat area they will adequately provide sufficient lighting for which you can monitor the activities around your compound. If you are into using night vision equipment then these solar powered lights can enhance all your additional equipment. The light power output is usually small enough that they would not readily be noticed outside your immediate area or for any long distances avoiding the possibility of alerting the less desirable elements during those crisis times. They are easily used indoors to provide sufficient light for safe movement in your retreat but once again not sufficient to attract undo attention. Imagine these lights outside during the day charging and retrieved for inside use at night. All you need to do is take them to your backyard in the morning and let them recharge for the following evening. Generally these lights operate small high efficient LED's which will last you from 8 to 10 hours on a single charge. That is more then enough to get you through the evening. Batteries used in these lights are usually the AA rechargeable. With a little experimentation on your part you may find that you can use these same units to operate a small fan or even a cell phone charger. These patio lights are generally very inexpensive and are purchased in packs of four or more. Now is the time to start looking for the sales as they frequently go at discount prices near the end of the summer season. Family Dollar is a good place to locate them at very reasonable prices. You can usually find a package of 6 for less then $20 dollars. Yard sales and flea markets are another great place to find bargains on these useful accessories. An interested note here is that you may wish to store these lights with the understanding that they can be damaged by EMP. The Light Emitting Diodes that are used to provide the actual light pass current in only one direction. When these electronic components are exposed to sources of EMP they receive a surge of current which quickly overloads and burns out the LED’s PN junction. In which case they should be stored within a metal trunk or metal garage which is properly grounded in order to survive any EMP situation. When we are in the process of bugging out to our retreat do we really need a spacious home with all the luxuries that we are used to? After all modern inventions tend to use vast sums of energy in order to run properly. There have been many folks in our history who accomplished a great deal with the bare minimum of space. Imagination also provides each of us with the ability to do a lot with so little while making maximum use of products for which the use we employ may not necessarily be that for which the item was designed for. Simplicity is often the key to inexpensive survival. You can find even today that many of the areas within the Ozarks use electricity that is produce by a small generator or perhaps even a very strong car battery. These are not rich people by any stretch of the imagination and as such they have learned to conserve each and every penny that they have. Naturally their homes are not equipped with all the modern appliances that we have in ours. They have a fairly small home with few rooms. They may even have a windmill that provides them with a sufficient amount of electric power for lights and possibly a refrigerator all for the small sum of $5,000. If you boast your expenses a bit to the $10 grand mark you may even be able to include a water pump system that operates your nearby well. If you plan to use a windmill system it would be well for you to adhere to some simple hints. To be effective a windmill system will usually require a constant source of wind so this is one item to bear in mind when figuring out your power requirements for your retreat. These windmills would be set up to recharge a series of battery packs that provide the energy to several of your most important pieces of equipment. If you have too much wind in your vicinity it is likely that you will want to install a brake on your windmill in order to stop it every now and then. Windmills should be shut down if there is a bit too much wind to turn the blades. There are many ways that we can possibly downsize when we are initially designing our bug out retreats. Since at this point we may have decided that we do not require such large quarters to live in then space is certainly at a premium. An interesting concept that has been employed by people in the past is the idea of under-floor storage. Under floor storage is something that you should plan for when you are initially drawing up the plans for your retreat home. You could very easily dig a hole and wall it up with concrete blocks. It would serve several purposes for storage as well as for emergency locations from adverse weather. The trap door would lead to the flooring above in the main room which could have a throw carpet placed over it to essentially hide it from prying eyes. If you have the extra funds and you really wish to get fancy you could easily include one or two of the steel shipping boxes. They could very simply be constructed to provide a good emergency home. The boxes usually cost in the vicinity of $12,000 dollars each. Although at the size that they are you may end up using at least two of them. So as you can see it is possible to obtain a basic but affordable home for use as your emergency retreat. Whenever a survivalist considers starting their food storage plans one of the more important considerations that they must take into account is the amount of space that is available. Without adequate space one can not properly store a sufficient quantity of needed food supplies. I have found that the best way to store food is in a dehydrated manner. Dehydrated foods take up less space and can be quickly re-constituted when it is needed. No refrigeration is required for these foods and their long life span contributes greatly to their value towards emergency food supplements. After noticing the prices of dehydrated foods it rapidly hits home that we should be making a lot of our own products as opposed to purchasing them. Every time I look at the prices of dehydrated foods in the market place I rush home and take out my food dehydrated to make something else. It is best that we build up a sufficient supply of the foods that we use and not those that may be available but no one in the family ever eats them. That is simply wasteful. One of the most useful dehydrated foods that I have found is tomato powder. It can be re-hydrated for use as tomato sauce or as a seasoning for a variety of different dishes. In the event that you are growing your own tomatoes this year you might wish to consider planting some of the Brandywine varieties as they make the best dried tomato powder you can find. When you dehydrate your tomatoes you may wish to consider keeping it in a salt shaker. When filling the shaker you should add 3 parts of the tomato powder to 1 part of salt. Stored in this manner it contributes a great bonus flavor to your morning eggs or as a mixture to flavor oils or dressings. You can add it to the top of baked bread for an additional zest in flavor or as a spice on your evening rice or baked potatoes. You can also use it for your Sunday spaghetti sauce. The uses for this practical item are just about endless. When you make the powder you will want to squeeze every last bit of juice from the tomato. In the end if you are left with only pulp then you know you did your job properly. Although you could dry the pulp you will find that most of the flavor is bound within the juice itself. The pulp is actually what we will be drying and ultimately powdering while the juice can be employed for anything that you would normally use the juice for. Keep in mind that you will need to break the dried tomato leathers down very fine or you risk damaging your food processor. If you add canned tomato paste to your powder mix you will quite likely find that it dries with the consistency of mortar. It can destroy your kitchen appliances if you are not careful. It is best to break it up into small bits and powder it slowly a little at a time. I love growing lettuce. It's fast, easy and is the perfect container gardening vegetable. 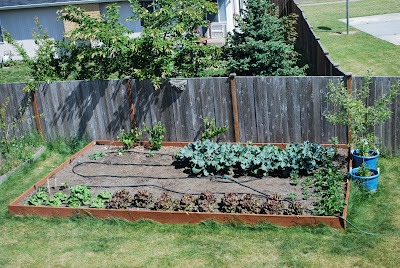 An advantage of growing lettuce in container gardens is that it easier to protect container gardens from pests. I've had too many lettuce plants devoured before I get a chance to. Now put my lettuce container gardens up on tables or chairs to protect them from the woodchucks, squirrels and bunnies that love to feast on lettuce. You can grow lettuce in almost any container, as long as it has good drainage. Your container can be fairly shallow, because lettuce doesn't have long roots. I love growing lettuce in colanders. You can get a giant one at a restaurant supply company. Smaller sizes are easily found at discount stores, yard sales or second hand stores - this one cost 50 cents at a yard sale. You do have to be careful with any metal container, in the blistering hot sun because they can get hot and cook your plants root system. Lettuce generally doesn't like blistering hot sun anyway, so keep your lettuce container gardens shaded in the heat of the day. 1. Cut a piece of window screening to fit your colander. This will keep your soil in and let water out. 2. Fill colander almost to the top with potting soil. 3. If you’re potting soil doesn't already have fertilizer in it, mix fertilizer into your potting soil, following the directions on the package for quantity. I use an organic slow release fertilizer. 4. Plant your lettuce seeds or seedlings. Lettuce grows quickly so if you are planting seedlings, give them room to grow. If you are planting seeds, make sure not to plant them too deeply. I often use special seed starting medium to cover the seeds as it makes it easier for them to break through, as they grow. 5. Water generously. Lettuce needs lots of water. It is considered a cool season crop, but certain kinds tolerate heat better than others. 6. I like growing loose-leaf lettuces and lettuce green mixes, because you can continue to pick the outside leaves over long periods. With head lettuces, you generally wait until the head if formed and pick the whole thing. We are all survivalists and were beginners at one time or other and each of us could perhaps share an interesting anecdote or two concerning our experiences. Unfortunately, the new survivalists often learn the tricks of the trade the hard way and many times even the more experienced of us survivalists may overlook important aspects associated with bugging out or retreat creation. Although the saying of live and learn may apply to most situations I for one do not desire to chance a philosophy such as that to the well being and survival of my family in an emergency situation. Perhaps this short article may serve as a reminder to both the newbie’s as well as for the experienced pros in what not to do. All survivalists should become familiar with their survival gear. Don’t wait until an actual emergency condition to find out that something is amiss with your equipment. This is exactly the mistake that is often made by the new survivalists. All their equipment is new and still packed in its original boxes and actually have never been opened. They wait until they are at their retreat or in the middle of the woods and embarrassingly discover that something is wrong. By then my friend it is simply too late. Always try any new gear out prior to storing it and above all if a piece of equipment requires batteries never store the batteries in the equipment. Make certain that you do in fact have extra batteries but never place them in the equipment when it is stored. Many times I have witnessed new survivalists suffering through the routine of trying to install a piece of valuable equipment in the field only to tie up a considerable amount of time that could have been used better for something else. Don’t be one of those people who fumble for several hours trying to decipher how to use one of their newest gadgets. Always check out the operation of any new lanterns and stoves that you may accumulate to make certain that they are in fact operational. Survival is all about being prepared. New survivalists will often forget the importance of including enough clothing in their bug out bags. You may not have any means of washing clothes initially when you have to bug out. In addition the various types of weather conditions may dictate different sets of clothing so make sure you are prepared. Make sure you take appropriate rain gear in the event of showers, swim trunks in case you desire to take a dip in the local river and a light jacket or sweater for the cooler evening air. If you are a new survivalist and just starting to develop your own survival bug out exercises the first rule of thumb is don’t go far initially. Give yourself time to work out all the bugs of your equipment listings and operations. Keep close to home at first and slowly advance to further exercise points. You may discover that some of your gear is not operating as it should or perhaps you didn’t take enough food and you unfortunately ran out. Any number of occurrences may happen that could affect your bug out exercise negatively. Initially take several shorter trips closer to your home. Hopefully you have a start on becoming a more effective survivalist and one important point to remember is to take advantage of the knowledge of the more experienced survivalists. They have been there and done that. Good luck. There is still room for a few extra little things. I will let him seal the lid when he is ready. If for some reason he needs to open the bucket to add/change out some stuff, he will just have to spend $2-$3 on a new lid to make sure the bucket stays properly sealed. Yeah I know these types of kits are nothing new, but I thought I would post it anyways. I found a similar bucket on the internet (not as well kitted out though) for like $120-$150. I made this one for $45. For many reasons one can not often protect their assets as they would like to. These reasons may range from the lack of the necessary money to accomplish all that would be needed to various local ordinances which would forbid installing certain protective devices. Even if you can not afford all the luxuries of protection that other survivalists have done there are still ways that you can adequately protect your home and your family in times of crisis. If you are like any other survivalist you have been putting a few supplies away just in case for many years now. You and I both know that when a crisis develops you will likely become the target of others who will want what you have worked so hard to save. The key to this problem lies in taking passive defense measures that will offer you the same protection as those that spend a great sum of money. Granted that minor measures will certainly never stop the hungry marauders but there are techniques that may delay them as much as possible. Initially you must never advertise what you have. The less other people know your supply levels the better you are to deal with the situation. If they do not know it is there chances are good that they will not bother you. Protect your home the best you can by planting common rose bushes around it. The thorns that are part of a rose bush are just as effective as Barbwire and no ordinates can object to them. Try to make your home look like no one is living there. If no one is living in your home chances are good that the hoards will pass it right by thinking there are no supplies there as well. A sneaky trick would be to arrange to have some weathered plywood readily available to place on your homes windows. If your boards appear to look aged the roaming bands will be less likely to bother your home thinking it is abandoned. Most of the opponents that will approach your home are likely going to be armed and as such it is important that you develop a means of defensive combat tactics. In war there is only one rule and one rule only – Win! Learn about guerilla fighting tactics and how best to use them to your advantage. You may even need to know and understand many unconventional techniques in order to save your family and yourself. Make certain that each member of your family knows what their responsibilities are in the event of a survival situation. Assign responsibilities to all and rightfully expect them to be done and done right. Practice several times per year maybe even more often if you can. Americans are quickly becoming aware of the value placed in home emergency management. As with any type of management program a family emergency plan is a critical aspect of the overall program. Let’s be real here. At any moment either a natural or manmade emergency condition can occur. Developing your own disaster plan could be the life and death difference for your family. No longer are emergency plans of this nature restricted to government agencies. As I always say, “we must learn to take care of ourselves”. We simply can not rely upon any government agency or organization for our welfare. We must take the necessary responsibility for accumulating our own emergency supplies and the knowledge of what to do in an emergency. Of prime importance, is knowing the possible emergencies can happen in your neck of the woods. We are a complex society and as such we open up many possible scenarios that can result in either manmade or natural calamities. These days we are experiencing very sever weather conditions which we have never experienced in the past. The weather has become completely unpredictable and extremely dangerous. To be properly prepared we must become aware of all the possible natural disasters that exist around our area. Don’t be mislead into thinking that the sever weather problems are the only concern for at any time a manufacturing plant can release fatal fumes or create explosive atmospheres that may cause us to consider evacuation of our homes. Nor can we underestimate the destructive nature of the hurricanes that seasonally pound our coastal shores. What about an extended black out that may occur across your area of the country? Any of these quoted emergencies are possible at just about any area of our country. The family that is properly prepared for any sort of emergency will generally have several emergency plans in the works. One for those times when you have to remain at your home and another in the event that you must depart your home and evacuate the area. It isn’t just the idea of having an emergency plan but you must also have one that is comprehensive in nature and well thought out. The purpose of a family emergency plan is to assist in saving our lives and curtail panic during those times of crisis. As we have stated every household should have two such plans and here are a few items to consider when developing your individual plan. Consider how your family can safely exist your home and neighborhood. Designate a family meeting point where you all can assemble when a disaster happens. In the event that you must pick up your children you should have a designated person to do that task. Have related health information readily available for all members of your family. You may wish to have one of the older land line phones available that did not need electricity. Determine the potential risks that are within your immediate area. If you are a pet owner you must give serious thought to what you will do with your pet if you have to evacuate the area. Make certain that every member of the family knows the locations of your home fire extinguisher, the water shut-off valve and the electrical box. Your next step should be to preparing a “Bug out Kit”. You should always have sufficient supplies of food and water to last your family for at least seventy-two hours. Keep in mind that the larger the supply the better you would be. Once again if you are a pet owner keep a supply of pet food readily available as well. During most emergencies you can expect to lose your electricity so you should consider keeping the following supplies close at hand. Older non electric land line telephone. Manual type of can opener. An extra propane tank that can be used on your barbecue grill. Portable flashlights and battery operated radios. A well supplied first-aid kit. Any prescription medications necessary for family members. A set of extra keys for the car and home. Several bottles of hand sanitizer. About two to three hundred dollars in cash. It should be in small bills. Several rolls of coins can be very helpful. Any special items such as baby supplies or special equipment for those with disabilities. Always fill your bathtub with water when notified of an emergency. Keep a bucket handy to use for flushing the toilet. Remember no electricity no water in the toilet bowl. All members of your family should have their own “Bug out Bag” in the event you must evacuate the area. Don’t be caught with only the clothes that you are wearing. Always include not only your fresh clothing but also some hand sanitizer, a few snacks, a water container and things to occupy your time like a book or something. A very important item not listed in many emergency or disaster preparedness plans is knowing your neighbors. If it’s “crunch time” you will need to know who you can count on and who you need to avoid in a crisis. We’re not talking about the person next door. We’re talking about everyone in your neighborhood and the ones down the road. You will need to KNOW your neighbors. Neighbors can be a valuable resource for your survival. You might have a police officer who lives fairly close that could help out with protection and security issues. There may be a doctor or nurse who lives close by that could help with injuries or illnesses if emergency medical services become overloaded or unavailable. There could be a dentist who could assist with minor health problems. Perhaps you’ve got a plumber or electrician living in your area that could help with emergency repairs that would restore your water and power after a disaster. You might even run across a contractor with plenty of tools and a generator who would be a really good neighbor to have around. It might even be a mechanic who could get a vehicle running to provide emergency transportation. Any or all of these persons, and numerous others that haven’t been mentioned, could come in handy during an emergency. During times when there isn’t a crisis or disaster to deal with, which is probably going to be most of the time, knowing your neighbors will greatly increase the security of your home. Good neighbors watch out for their fellow neighbors and will see things that don’t “belong” much quicker than a person realizes. You and your neighbors will spot an intruder who does not belong in your neighborhood or area much quicker and can respond faster to any threat they might pose. In an emergency or disaster situation, you and your neighbors will be able to pull together much quicker, a lot more comfortably, and in a much safer set of circumstances if you get to know each other before a disaster strikes. Good neighbors also make good friends! Granted that there will be some of your neighbors you will probably want to avoid and it will be much better if you know about them ahead of time. Finding out that someone is unreliable and not trustworthy during a disaster or a crisis is not the best time. Learn who you may be able to count on in a crisis. Are all the people around you going to be bad people? Of course not! But what happened with Katrina in New Orleans proved that bad people will take advantage of good people during a crisis if they can. As the last installment in our "Keeping Your Valuables Safe" series, today we're talking about making a special room for your special items. Some people want not only a panic room (to safe-keep themselves in case of a "situation" but also to keep any valuables that don't fit in a small safe or cache. You don't have to build a special room, unless you want to. (For free downloads for building special rooms for either a "bomb shelter" or to use as a panic room, check out the FREE section at http://www.williams-et-al.com/ - It will be up and running by this weekend!). Also known as a "refuge room", we're going to call this a "safe-room" - good for keeping people and their valuables safe. An extra line of defense before a criminal can reach you. These rooms can be quite expensive and elaborate, but a little inexpensive do-it-yourself work can make a room you already have capable of providing major protection. Most important is locating your safe-room where you can reach it in a hurry. Since many break-ins happen at night, it's best to make your sleeping-area your safe room. Here's a few things you can do to make your bedroom to make it a safe-room. Take off your regular bedroom door and install an "outside" door. Get a massive, solid-wood door with a heavy bolt/lock. Make sure the hinges are on the INSIDE of the room so that an intruder can't get the door off the hinges. And since most doors can be kicked in, reinforce the bottom 1/3 with a metal plate. Have either a separate phone line for this room (so that it can't be cut from the outside), or a cell phone dedicated for emergency calls only. Keep it charged. If someone breaks in, call 911 and once you've informed the dispatcher of your address, your name and describe yourself and where in the house you are, then don't hang up! They can listen and record the burglar's attempts to get at you. Be careful of what you say (like don't threaten to kill the burglar) but keep a running narrative of any information you glean about the intruder. Most indoor walls are made of 2 layers of sheetrock nailed to 2x4 wall studs spaced a foot or so apart. Easy to kick through. So... you need to reinforce parts of your wall, especially around the door or anywhere someone could kick through in an adjoining room. Consider paneling with a strong material such as plywood. Be sure to use lots of extra nails to make it more firmly attached. Consider using concrete since it also protects from bullets and is a bit more fire retardant! Make sure your foundation can support the weight of concrete. Keep your firearms and other valuables in the safe-room. If you need your firearm, you have access to it. Just don't shoot at the police! And when meeting police at the door, be sure to put your firearm away first. Note: You may be able to fire a warning shot through your bedroom door to the intruder but before it even comes to this, check your local laws to see if you can legally get away with this. Since you could be burgled while you are away from home, make sure you can dead-bolt and lock the safe-room from the outside. Obviously, you'll need to keep the key with you! This way, the burglar will have to waste time trying to enter the safe-room and will have less time to break into an actual safe you may have in the room. A burglar alarm sounding in the middle of the night can give you a few extra seconds you may need to gather everyone in your safe-room and lock/bolt the door. Install an inexpensive burglar alarm with motion sensors or infrared detectors. Consider keeping at least some of your extra supplies in this safe-room. Besides your valuables and firearms and ammo, keep some of your stored food, extra toiletries and bottles of water under the bed or in your closet. That includes your portable toilet too (if you don't have a bathroom connected to your bedroom). Even if you can't do a lot of this, price out what you CAN do, then do it. So... what have YOU done to create a safe place for your valuables? You need a really good set of cookware... light enough to carry long distances and durable enough to not flake coating into your food! First, you need enough volume in whatever cookware you have in order to cook the amount of food you're going to need for who will be there. This is also dependent on the kind of food you like to cook, and your appetites. Second, it needs to fit into a certain weight category. If you're going to be walking for 4 days, carrying around cast iron cookware will become too cumbersome, making your abandon it along the way. Next, it should be as compact as possible. Most kits nest together. For a trip for two people, consider getting a "two-man" set. These are compact, with the pieces nesting inside together. The lid can be used as a frying pan, especially if you have a detachable handle (pot grabber). They usually have two small bowls, which is really the only dish you need, besides a cup. You also need a coffee pot, good for boiling water for tea, instant soups and oatmeal, and yes, even coffee! There are a lot of kinds available. Each person would also carry their own cup. Some people hook it on their backpack to have it readily available at any moment during the hike. For a trip with more than 2 people, just add more two-man kits and a frying pan or two. Titanium is a good kind of cookware as it's very light to carry but it's very expensive. Aluminum will do in a pinch but it tends to leak toxins into your food. Stainless steel may be your best best. The kits that are made for girl scouts, mess kits, are ok. I've had mine for a long time, and after a lot of uses, flaked apart. Using up those delicious garden vegetables! Combine water, yeast, salt, oil and honey in a large bowl and let sit until foamy. Add the flour and knead well. Place in an oiled bowl and let rise to double. Punch down and roll out to 1/4” thickness. Place on an oiled pan and lightly brush the top of the bread with olive oil. Sprinkle with cheese and rosemary and top with tomato slices. Let rise to double again. Bake in a pre-heated 375 degree oven for about 25 minutes. One of my other favorite ways to use the vegetables from my garden (or ones you buy at the store) is this quick and healthy vegetable side dish. There isn't a fancy name for this recipe, it's just something I throw together for a quick side dish and a way to get my kids to eat their vegetables. I just coarsely chop up any vegetables I have on hand in the fridge (zucchinis (there's always tons of those going around! ), onions, mushrooms, bell peppers, etc.) and toss them in a drizzle of olive oil (or you can use butter for more flavor). I sprinkle the veggies with Montreal Steak Seasoning (my ALL time favorite seasoning!) and Johnny's Garlic Spread (my second favorite seasoning--both you can get at Costco in BULK!!) and put it in the oven on a cooking stone. I broil this at 450 degrees until the vegetables are slightly soft and have a few crispy edges (like they were grilled on the barbie). Put your pan down on the lowest rack to prevent burning. You can also just bake these vegetables, but I like the crispiness of the veggies verses the soggy-overcooked flavor baking gives. This is just a quick option to skewered vegetables without all of the skewering! I served these tonight with the Teriyaki Pork from this weeks menu planner and it was AWESOME!! Would you like some chocolate with your zucchini? In large bowl, combine flour, cocoa, cinnamon, baking soda, baking powder and salt, mix well. In separate bowl, combine sugar and eggs, beat until well blended. Add oil and vanilla; beat until combined. Stir in zucchini. Add flour mixture; stir just until moistened. Stir in nuts and chocolate chips. Spoon evenly into loaf pans. Bake in preheated oven for 55 to 60 minutes, or until toothpick inserted in center comes out clean. Cool in pans for 10 minutes. Remove bread from pans; cool completely on wire rack. This is the time of year to have your eyes open for wild edible plants and to begin storing up your favorites. Buy a good book and meet with knowledgeable friends to forage the woods and open spaces for the bounty the Good Lord brings forth every year. Of the many edible plants you can select, berries are always the number one favorite, and many quarts of jam and jelly will be processed as the fruits ripen over the next few months. To can your own jam or jelly, requires the acquisition of a large number of canning jars now, for later use. Check for store sales of jars and lids, of pectin and sugar, along with specials on various fruits at rock bottom prices. Do not pass up the garage sales either which can be a gold mine on canning bottles and products. Learn something new this year. Try different methods of canning your favorite foods and fruits. If you wish to try some new interesting processing methods, try some of the pioneer methods of preserving foods. One such method called ‘pemmican’, is mainly meat and berries pounded together to make meat/berry cakes, which will last for several months without refrigeration, and can last you through the winter if you keep them stored at a constant cool temperature. Try improving your food storage area. Consider maybe increasing the size of your storage area and/or try improving the insulation factor of your food storage area. This can be done by adding ‘closed in cabinets or cupboards, or by simply insulating your garage door itself, or replacing your non-insulated garage door with an insulated garage door. Anything you do should have a goal of lowering the area storage temperature to below 70 degrees, which is the ideal highest temperature for best results in the longevity and saving of stored fruits and vegetables. Your garden should be well underway now as we are past the last frost. This year, try experimenting with some new species of your favorite crops, such as several varieties of corn, and squash. My garden is already producing fruit and vegetables. Yeah! We have been harvesting salad on a regular basis. Two days ago I also sampled one of my very hot radishes and then I cooled off my tongue with a large fresh strawberry. Nothing tastes better than fresh produce. Continue to watch for food sales and store coupons that reduce your food bill costs. If you have been doing this all along, you may find that now, the only time you have to go shopping is for milk and to pickup items when something they are on sale. It is amazing the comfort it gives you to have a minimum of one year’s supply of food in your pantry and food storage. Personally we have two years of grains, dehydrated foods and freeze dried foods in our long-term supply stored up. We also have our regular pantry stuffed with enough fresh foods and water to easily last three to five months. It is packed full of things we like to eat all of the time in our regular diet. With all of the world events going on right now, it is easy to lose focus of what is most important and what order of things in the world take priority. I have had a few thoughts on this subject lately as I get daily bombarded with what seems to be one catastrophe after another both in the World and here at home in the United States and more directly our homes here in Washington State. Priority Number One - Taking care of your health must come first. Without your health, you can not be much help to your family and friends. This is not ignoring the fact that many of us do have some stage of a health issue in our life, be it our own personal health issues or a member of our family’s. But we must treat the walking wounded and do all in our power to stay healthy. Diet, and exercise and possibly continued medical treatment for issues must take precedence. If you are on medications, take them religiously. Be careful if you self medicate that you do not get too much of a good thing. Also, question your prescriptions and which might be in conflict, with your pharmacist. Recently, I had a family member that was prescribed a medication by one name, while already being on the same medication under a different generic pharmaceutical name. Fortunately a friend of the family visited her three days after her surgery and recognized that something wasn’t quite right; investigated and had enough medical background knowledge to know to check with poison control who immediately wanted 911 called and a trip to the emergency room. This medicine conflict placed her in the hospital while her liver function and kidney functions were monitored for several days. There was concern that her kidneys might stop functioning and dialysis was being considered. After several days of flushing out her system, her health was restored and she rejoined her family at home. Had the neighbor not dropped by and questioned the situation, it could have proved fatal. Always challenge your medications and scheduled surgeries to determine if they are correct and necessary and are not in conflict to your good health. You must look out for your health; no one else has as vested an interest in you as much as you do. Your friends may not notice something is wrong. Priority Number Two - Take care of your family by being knowledgeable of their health needs and safety. Maintain a health history and list of medications for all members of the family and have written instructions for specific needs and contacts in an emergency, including insurance coverage, doctors names and hospitals. Priority Number Three - Stay involved with your neighbors, immediate community and schools. Getting to know your neighbors and getting them to know you and your family is very important. There are several programs already established that are available to help you in your neighborhood. 1. Neighborhood Watch – If you do not already have a neighborhood watch program, contact your local police department and get information to start one in your neighborhood. Staying active in your community and knowing your neighbors provides peace of mind and a certain amount of security and safety is established. 2. Map Your Neighborhood – This program helps blocks of neighbors to get to know each other and to find out resources that can be shared to help out each other in case of a disaster or in time of need. Contact the Washington Department of Defense, Emergency Preparedness Program at Camp Murray in Lakewood for more information. 3. CERT (Community Emergency Response Training) – Get certified in disaster training incase of the worst-case scenario. This is most excellent training and I highly recommend it for everyone in your neighborhood. Of course these numbers will never happen, but it is really good to get as many people trained as possible. Information about CERT can also be obtained from the Department of Defense at Camp Murray in Lakewood. 4. Red Cross (or equivalent) First Aid Training – One cannot have too much training in first aid. All of my family members have had years of first aid classes and have all used it at different times at car accidents, home injuries, and a few in actual life saving situations. First aid gives you confidence in yourself and a feeling of security. It isn’t being perfect or knowledgeable like a doctor might be, but a degree of self help is always a comfort. 5. Learning to Swim – If you are a noon-swimmer, stop right now and make contact with a pool and take lessons to be able to swim. It is a confidence builder and it also will save a life. In a weird twist of fate, a young man I taught how to swim in the Boy Scouts, was able to save the life of my youngest son several years later when my youngest son who had dove into Lawrence Lake off the dock and had become entangled in the mil foil water plants at the bottom of the lake. This boy recognized the danger, ran down the dock and jumped in and pulled my son to the surface and got him breathing again. This is a debt I will always owe to this young man who is now our family’s hero. Priority Number Four – Stay abreast of the politics and government decisions being made around you and do your part by voting and making contact with your legislators when you agree and disagree. It is important that we know what is happening. We can only be prepared if we know what to prepare for. This is not a time in history for apathy. Make your voice heard. These do not cover everything that the world may throw at us, but they will give you a great start on protecting yourself, your family and friends and neighbors, and make a great start in being prepared. I'll be leaving on Saturday for 9 days of mountain man style camping, so like a responsible blogger, I'm breaking up something that could be one long post and scheduling it to run in segments periodically throughout next week so you won't be bored silly while I'm gone. It should actually be more regular posting than I've been doing lately while I've been here! A while back a friend and I picked a boatload of cherries. Okay, about 4 buckets full. They were sweet cherries like Bing (not sure the actual variety, but they were not pie cherries). This cherry source came on kind of unexpectedly, so I had to make some time to take care of all the cherries. Here's my advice when you've got a lot of food to preserve: invite a friend or two over to help you. We ended up bottling, dehydrating, and freezing cherries until we were sick of seeing cherries, but we got those 4 buckets of cherries taken care of in a day (this would have taken a week of afternoons on my own--hooray for friends!). If you get a bunch of cherries, bottling them is the easiest and quickest way to get them preserved. It requires no special equipment aside from some pots, canning supplies (jars, lids, etc.) and a water bath canner. First, wash the cherries. I just stick them in the sink in some water and kind of swish them around a bit. Heat up some light syrup in a big pot (3-4 C water to 1 C sugar or 4:1 ratio of whatever you want to measure with). Put some lids in a pot and put them on low heat. Put water in your canner and get it heating up. Now while everything is heating up, put cherries in jars. This is not technical, you just take them out of the wash water and put them in clean quart jars. You could do pints also if you want to--I just have kids, so we do fruit in quarts now. When you've filled 7 quarts (or however many jars your canner holds), pour the hot syrup over the cherries. I put the jars on the stove when they've got the cherries in them so they'll kind of heat up before I put the hot syrup in. Wipe the rims, screw on your hot lids and put the jars in the canner. I had one jar break this round because the water in the canner was boiling when I put the jars in. These jars are not real hot, I had better success putting them in before the water boils and letting it all heat up together. Subsequent batches I shut the canner's burner off and let the water cool a bit while I got the next round of cherries in bottles. Put the lid on the canner and let the water boil 25 minutes for either pints or quarts. So if you put the jars in before the water boils, don't start timing until the water is boiling. At the end of the canning time, take the jars out and let them cool. For some reason, these seemed to take a long time for the lids to pop down--had me worried a bit, but they finally did. I loved bottled cherries as a kid, but this is not my favorite way to process cherries anymore. The great thing about it is that you are able to process quite a few cherries with minimal equipment. You do have to spit the pits out as you're eating them--that's half the fun of eating bottled cherries!